The number of women in prisons around the world is growing rapidly - up by 50% since the year 2000, compared to a rise of just 18% for men. Re-offending rates are alarmingly high and the stigma of a custodial sentence can make finding a job impossible. But women who are taught to set up their own business are bucking that trend. It's still dark when I meet Janet Powell early in the morning at London's New Covent Garden market. Instantly likeable, with bright eyes and a warm smile, she seems to know everyone. 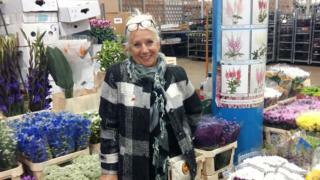 Janet loves the banter with stall holders as she chooses flowers for her floristry business. But her light-hearted manner masks a difficult past. She went to prison seven years ago and served six months of a year's sentence for money laundering and fraud. Her release posed another challenge. "I knew I wouldn't be able to get a job," she says, "I was in my 50s, I knew the minute a company did a CRB check on me, money laundering and fraud isn't a great thing to have on your CV." "They paid for my laptop, business cards, website that was the kick-start and then the business started to come in." "When people say to me: 'Why do you bother to do it - why don't you help the other people out there who haven't offended?' I think: 'Do you know the challenges these women have faced?'" Juliet says. These challenges may be mental illness, domestic violence or a dysfunctional upbringing, she adds. But Ms Hope believes passionately that everyone deserves a second chance. "They have faced that, come out, and want to turn their lives around." The re-offending rate amongst women who have set up businesses with help from Startup is less than 5% - a stark difference to the 45% of women in the UK who are re-convicted within a year of release. Juliet says the demand is enormous, but this particular pilot scheme is now on hold pending government funding. Lori Collins benefited from a similar scheme in Florida in the US - the country with more women in jail than anywhere else in the world. Eighteen months before the end of her burglary sentence, Lori, who had suffered from a lifetime of mental illness, was accepted onto a programme called Leap (Ladies Empowerment and Action Program). It gave her training and support to set up a business once she was released. 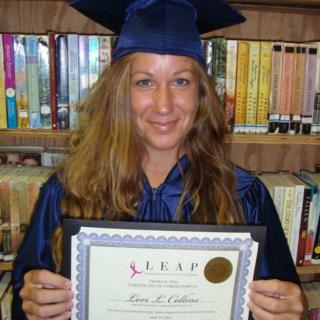 Based out of just one prison in Florida, Leap is much sought after but only took 10 women out of the 185 women who applied at the same time as Lori. "It was the first time in my life I had women of substance look at me and tell me I was worth it. Without that support I'm not sure where I'd be or what I'd be doing but certainly not this." Lori's business is called Blooming Organics. She grows edible flowers and uses them to make sweets and lollipops. She is not yet profitable but makes enough money to keep it going and to employ female ex-offenders whenever she can. "Those women also work with me in my business when I have a big order... it helps them bridge the gap in their employment history." 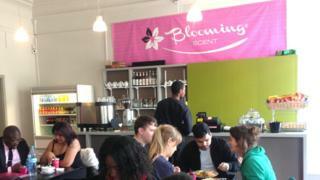 Back in London I meet Gina Fawcett at her cafe in a community centre in Tottenham. She bubbles with enthusiasm, barely able to sit still as she tells me her life story. In spite of a supportive family Gina went off the rails as a teenager and by the age of 24 she was a single mum of twin girls and was sentenced to six and a half years in London's Holloway prison for importing class A drugs into the UK. At first, prison was terrifying and she desperately missed her children, but one day the Prince's Trust charity came to give a talk on entrepreneurship. Gina claims she only attended "to get out of being locked in", and when those prisoners listening were asked to come up with a business idea she said: "Oh erm... I want to be a florist." News of her new ambition spread to the prison governor who then allowed her to do a training course at a college outside the prison on what's called "release on temporary licence". At the end of the year's course she was back in prison full-time to complete her sentence. Unwilling to let her hard work go to waste she managed to persuade the governor to let her set up a floristry business outside the prison gates. It was surprisingly successful and she had a steady flow of customers - prisoners, staff, visitors and members of the public. Once she was released the Prince's Trust got back in touch. 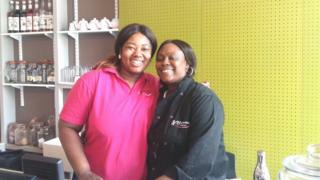 They helped with a start-up loan, found her premises in a community centre and gave her a business mentor. Now eight years on she has three businesses: two cafes in Tottenham and a florist. She employs 12 staff, including ex-offenders like her great friend Lisa, whom she met inside Holloway. I asked them whether they were the exception in prison, keen to turn their lives around. Lisa does not think they are unique. "There are good ones there. What they need is support when they come out... there are girls who want to change their lives for their kids and there are a lot of mothers in prison. " Gina feels the weight of responsibility of being an employer and says this is what drives her on. "I would let the Prince's Trust down, let the governor down, let my family down. All the people who I'm paying wages for every month now - what would they do [if I failed]?" Janet, Lori and Gina have all been determined to support other ex-offenders like themselves. Similarly, ex-banker Teresa Njoroge in Nairobi, Kenya set up a charity to help ex-prisoners after she spent a year in prison on a fraud charge. She says most of the women she met inside were there because of poverty. "These women would come in in their hundreds every single day having been picked up on the streets." Many were on remand or had short sentences for petty crimes such as not having a licence to sell their wares in the street. "It would be a cycle because they'd be released after a month and then after another month they would be back." Teresa is a dedicated campaigner for non-custodial sentences because of the devastating effect she says prison has on women and their children. She runs training programmes in prisons and supports women ex-offenders with funding from local churches, helping them find a job or set up a small business. Lucy is one of the women currently benefiting from Teresa's charity, Clean Start. She spent 18 months in prison for handling stolen property after she bought a mobile phone. 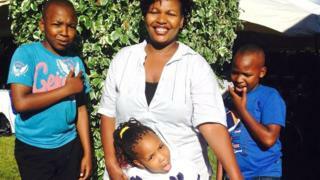 She was on remand and eventually the charges were dropped but not before she had lost everything. Lucy had lost her home and possessions because she had not been paying the rent and her friend would not let her stay with her because of the stigma of her having been in prison. Fortunately, she was told about Teresa's charity and is now in the process of starting a small mobile business selling ladies shoes to people working in offices. Catherine Heard, director of the World Prison Research Programme at the Institute for Criminal Policy Research in London, says that the number of schemes to help women set up in business after prison "are few and far between" but they are "exactly what we need". "Re-offending," she says, "is about people realising they have little option but to carry on, whereas if they are given a chance to do something for themselves they might have a chance to really question whether there is a better path for them." The women I met are not likely to become millionaires. Some are just getting by but hope to expand. But all are determined to break the cycle of re-offending and clearly feel empowered by the independence that a small business can give them. You can listen to the women featured in this article here. It was broadcast as part of the BBC's 100 Women 2016 season.